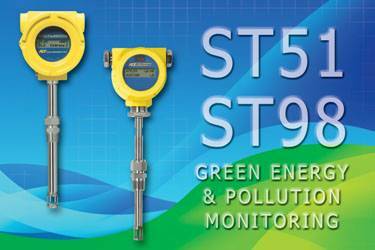 Process and plant engineers interested in green energy and pollution reduction applications are discovering the FCI’s ST51 and ST98 Flow Meters. These flowmeters deliver accurate flow measurement at an economical cost in green electric power co-generation and pollution monitoring/control applications. FCI’s ST Series Flow Meters feature rugged, no-moving parts designs suitable for hazardous plant environments requiring biogas capture and recovery systems for power generation and pollution control. The ST51 and ST98 are designed with a precision thermal mass flow sensing element, built-in temperature compensation and advanced transmitter electronics. The ST Series provides air and gas flow measurement with exceptional performance, low maintenance, long life and a low life cycle cost. ST51 Flow Meter The innovative ST51 Flow Meter is designed specifically to measure biogas, digester gas, and all methane composition gases including natural gas. The ST51 features a thermal mass, insertion-style flow element with flow accuracy to ±1% of reading over a broad flow range from 0.08 to 122 MPS, and repeatability of ±0.5 percent of reading. The flow element is available for use in line sizes from 51 to 610 mm diameters. It operates over a wide turndown range of 100:1, which is essential due to the variable gas flows in wastewater treatment. It operates at temperatures from -18 to 121°C and withstands pressures up to 34 bar (g). The ST51’s robust thermal mass flow sensing element has no moving parts or orifices to clog or foul to attain virtually maintenance-free service in wet, dirty biogas applications. It includes built-in temperature compensation circuitry for accurate, repeatable measurement year-round as temperatures rise and fall seasonally. The flow element is constructed with a 316L stainless steel body and Hastelloy C-22 thermowell sensors to resist corrosion. Approvals for use in hazardous environments include FM, CSA/CRN, Class 1, Div 1, Groups B, C, D; Class 1, Div II, Groups A-D, ATEX/IECEx Zone 1, II 2 G Ex d IIC T6 …T3, II 2 D Ex tD A21 IP67 T90°C…T300°C. ST98 Flow Meter The rugged ST98 Flow Meter sets the industry standard for performance and value with a reliable thermal mass flow sensor in a smart electronics package. The ST98 operates over a wide flow range from 0.21 to 172 NMPS in air with a standard flow accuracy of +1 percent of reading, +0.5 percent of full scale. It is ideal for a wide range air/gas flow measurement applications including natural gas or methane monitoring. With the addition of HART communications, the ST98 is now a drop-in network replacement instrument for any other HART-compatible flow meter, providing process flow and totalized flow data in a matter of minutes. The ST98’s transmitter with its RS232C communications port is housed in either a NEMA Type 4, Type 4X (IP66) enclosure or an explosion-proof enclosure and can be integrally mounted to the flow element or remotely mounted up to 150 metres away. In addition, an LCD display screen indicating flow rate, temperature and totalized flow is available as an option.